Hallelujah! Te deum laudamus! Deo gratias! I pulled off the family Easter dinner! This on top of going out Friday and being out all day Saturday at a funeral reception. I am not kidding. That is what Howard and I did. We were at this reception for seven hours! I know you are not supposed to say this about funerals but I had a fantastic time. All these people I had never met had this gigantic bar and were drinking up a storm. We got into a long argument over which is bigger, a jigger or a shot. We also talked about the pirates. I started that conversation which I was proud of because it then went on for at least an hour. I am fascinated with that situation and still am now that it has since been straightened out. The pirate city of Eyl. In the lawless state of Somalia! After the funeral reception we went straight to a Saturday night party we had to go to. I had a little too much red wine, no surprise there. Then this morning after Easter Sunday Mass it all crashed in on me ... uh, now I have to cook the Easter dinner. And clean up the house. All weekend I had been planning to do that but now the weekend was gone. It is a strange feeling for me. Usually I spend my weekends researching Leonard Pennario and I do not mind doing that. I love it. On holidays when I have to cook the family dinner, though, all bets are off. Well, there were so many highlights. The nieces and nephews are such a kick. Our George Henry, he asked Howard if he could have the cell phone that someone threw through our front window and Howard said yes. So George Henry brings the phone over to me and holds it out. "My cell phone," he says. He is in kindergarten and he is the cutest kid. He says, "Do you want to talk to your father up in heaven?" My dad died a long time ago. Then George Henry went on to tell me about this great place he has discovered called Niagara Hobby and how I have to go to Niagara Hobby with him. "They have knights there," he said. "Like King Arthur's Knights of the Round Table?" I asked. "Do you know who they are?" "Yes, I know," he said. "But they are not at Niagara Hobby. They have other knights." Then we all walked around the perimeter at the zoo and admired the statues of the alligators and the beavers. And our Rosie began confiding in me all of the occupations she is considering when she grows up. She is 13 now so that grown-up era is getting close. She named artist, reporter, spy, zookeeper and art preservationist. Isn't that the greatest list? If Rosie worked in the zoo she said she would have to work with the elephants. "I could throw hay bales at them or something." She said she was reading a book about a boy who found that elephants relaxed him. Our elephants are especially relaxing because they are retired circus elephants and they love to entertain. They entertain at zoo fund-raising events. That is a picture of our three elephants at the top of this post. It was taken in January but really, it could have been taken any time because our elephants are always acting like that. They are the greatest! And that explains why Rosie wants to be a zookeeper, and why I was nodding in empathy and understanding. 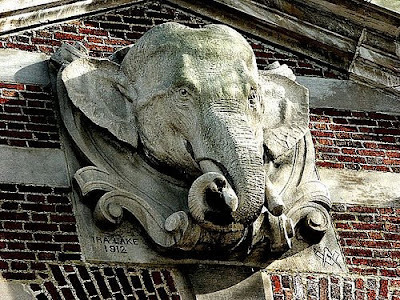 Here is the carving over the door of our elephant house which was designed by a major, major figure in the architecture world. I was trying to think what I wanted to do when I was 13. I do not think I had the foggiest idea. What I used to do was, I would lie around and listen to Mozart and Bach. If anyone had pinned me to the wall about what I wanted to do with my life I think I would have said: lie around and listen to Mozart and Bach. In essence what I did end up doing! But now, being a zookeeper sounds kind of fun. Perhaps I will pursue that after I am through with my book. 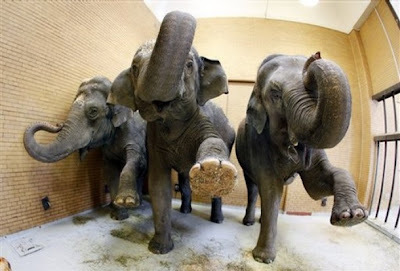 I can imagine the dyngus chaos, but thanks for the kind words about the elephants and the set-up at the Zoo. While they are understandably popular, we are also the clearing house for uninformed opinions on how to keep animals.